or watch what I eat when I put it in my mouth?????….. Look how proud he is of himself. Since then he has been making his own breakfast everyday. I am so proud of him for wanting to learn how to cook. He will make a good husband one day. Went to the beach yesterday and it was pure heaven to just sit there and watch the blue ocean go on for miles. Think he will read this and do it??? Ya know my birthday is coming up soon and what man would not want this for their wife. It's like a win, win situation....a cooler and table in one...think of all the hot summer days in the yard when I can fill it up with drinks while you mow the grass. A mans dream if you ask me. I just want one before summer is over and your in luck since summer can last all the way to October down here and sometimes even til Christmas. But if you give it to me at Christmas time there will be no filling it with nice cold drinks til next summer and even then I may have to think about it....Just saying. Have I mentioned that linen closets are evil. Short Mama from Family of Shorts hosts this mimi and I have fallen short on my posts lately . 1. My hair most of the time, I use to love it, but after having my son it went all weird on me so I just like it now. 2. My legs, not sure why I just do. 4. My stretch marks, well some of them….I wish I only had like 3 to signify I had a child, but I look like I have a road map on my stomach instead. I call them my blessing marks. I would pick one of each item in the Victoria Secret Catalog, because if I looked like them I would walk around in underwear and high heels all day long….Just keeping it real. 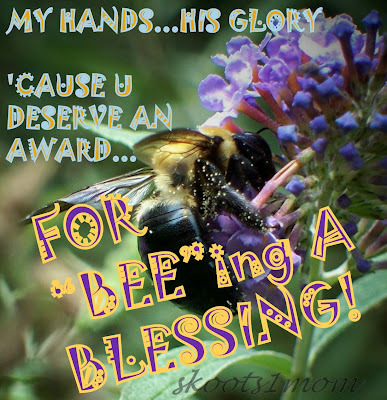 MY HANDS...HIS GLORY! Presented me with this award for her Best Blog of The Day. How cool is that. "A very tired-looking dog wandered into my yard. I could tell from his collar and the fact that he was well-fed that he had a home and was well taken care of. He calmly came over to me, I gave him a few pats on his head; he then followed me into my house, slowly walked down the hall, curled up in the corner and fell asleep. An hour later, he went to the door, and I let him out. The next day he was back, greeted me in my yard, walked inside and resumed his spot in the hall and again slept for about an hour. This continued off and on for several weeks. Curious I pinned a note to his collar: 'I would like to find out who the owner of this wonderful sweet dog is and ask if you are aware that almost every afternoon your dog comes to my house for a nap.' The next day he arrived for his nap, with a different note pinned to his collar: 'He lives in a home with 6 children, 2 under the age of 3 - he's trying to catch up on his sleep. Can I come with him tomorrow?" - C.S. Honey are you reading this????? If Christopher Columbus were married, he might never have discovered America, because he would have to answer all the following questions! What do I do when you’re not here? Would you have dinner at home? What would you bring for me? You deliberately made this plan with me, didn’t you? I want to go to my mother’s house. I want you to drop me there. I don’t want to come back, ever! What do you mean ok? Why aren’t you stopping me? I don’t understand what this whole discovery thing is about. You always do things like this. Last time you also did the same thing! Nowadays you always seem to do this kind of stuff. I don’t understand what else is left to be discovered! I am cleaning out the closets. I know I’m OCD and crazy. If you don’t hear from me in a few days dispatch the troops.